"Apple is preparing to launch 32-inch and 37-inch HDTV in the US next year, backed up by a rich library of on-demand content, it has been reported"
Instead of a form of set-top box (STB) like the Apple TV launched in 2006, Apple’s new products will be full TV sets…However, other sources also revealed that Apple may continue to launch its next-generation STB-like Apple TVs in 2012 as it has lowered the price of its current version of Apple TV listed on Amazon by 9% recently. 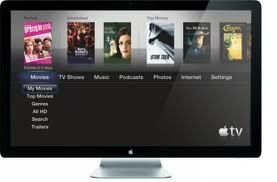 While Apple's new television sets are reported will integrate most of the new features that have been rarely owned by another TV. sources also indicate that Apple will likely release a "box" special and most interesting is the presence of Siri who had only exist in the iPhone 4S.